In the draft 2019-20 budget for Iran, the government has set aside $800 million to deal with the chaos created by unlicensed credit institutions, which is a massive outlay during the country’s ongoing economic crisis. In fact, that sum is equal or greater than that allotted to many government ministries and given the substantial cuts to Iran’s GDP from the huge loss in oil revenues; Iran has less money to play with than in previous years. But the truth is that the government has little other option. If those institutions fail and the people lose their money, then it would only spur more protests that the mullahs won’t be able to suppress. Just last summer, the Iranian government had to spend $300 million to keep unlicensed credit institutions going. However, one of the biggest problems with this is where the Regime is getting the money. They are merely printing more money, which then leads to rampant inflation. Some experts say Iran is already suffering from inflation of over 200%, although Iran has claimed its only 40% inflation. This is one of the reasons for the rial’s severe drop in value against the US dollar. Over the past 12 years, Iran has seen the establishment of a plethora of credit unions, banks, and loan institutions, but many have failed to obtain the necessary license from the Central Bank of Iran, so no one has checked the financial viability, internal regulations or banking experience of these outfits. These illegal, unqualified, and unregulated institutions proved popular with people because they promised high-interest rates and because no one knew not to trust them. Then, the institutions stopped returning people’s money, which led to an economic and a social crisis. 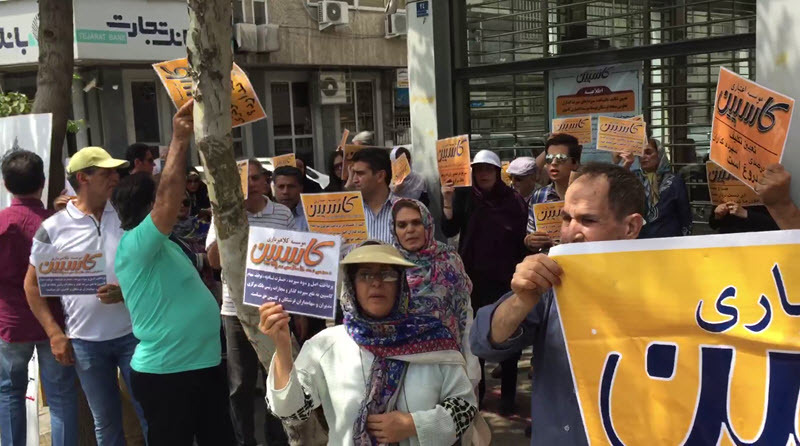 The cheated depositors took part in numerous protests, demanding that the Regime took action, but the authorities largely ignored them. However, after the mass anti-regime protests broke out in 2018, the Regime became terrified of ay protest, which is why they started spending hundreds of millions of dollars to shore up illegal banks whilst facing a budget deficit. But the real question here is how these institutions were not stopped at the first hint of illegal activity? After all, surely the Regime could see that banks operating without the proper paperwork would be likely to cheat their investors. Well, the answer is the people operating these “banks” were often associated with the Regime in some way; perhaps children of high-ranking mullahs or a local religious figure. That’s why courts often ruled in favour of the illegal financial outfits prior to 2018.